At the end of our trip to Scotland, half our international visitors had to return home, while the other half were headed on a two-week European tour. Some of us were vacationed out by that point (we did a lot of walking!) but we still had time with the remaining half our company. Luckily there’s no shortage of things to do in England, even if all you’re up for is a day trip. After scanning the available options, we decided to take a quick trip to Newbury. One universal truth about England is that every town or city has its own charm. Most of them are beautiful. Walking through the streets of Newbury, looking at the flowering gardens, aged buildings and rustic riverbeds, I thought it the kind of place I’d live if money weren’t an object. A walk down the street in a place like that is enough to set my muse on fire. 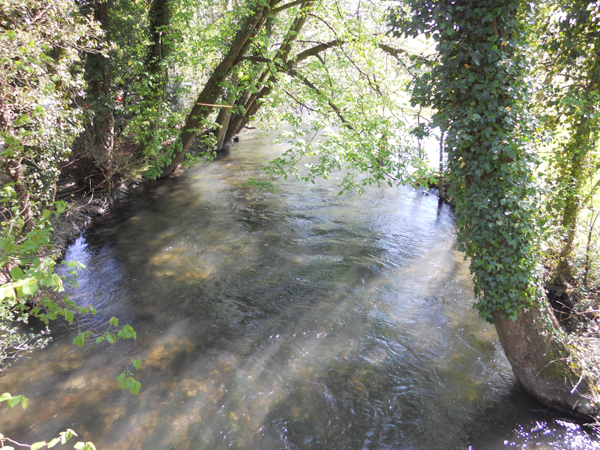 We walked across a bridge beside a small river. Glancing out over the tunnel formed by the trees, and the flowers growing at the water’s edge, I wished I could have stayed. A short walk from the train station we found the path leading to Donnington Castle, our intended destination. We wound our way up a hill and through a small forest. It was quiet, shady and, frankly, gorgeous. It’s easy to understand why someone wanted to build a castle in a place like this. 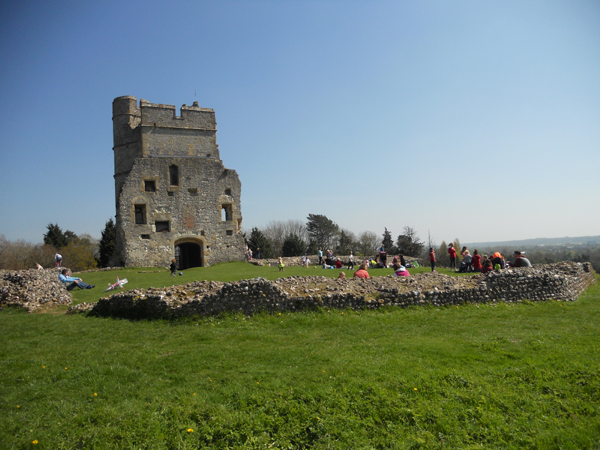 Donnington Castle was a fashionable fortified residence during the 14th century. 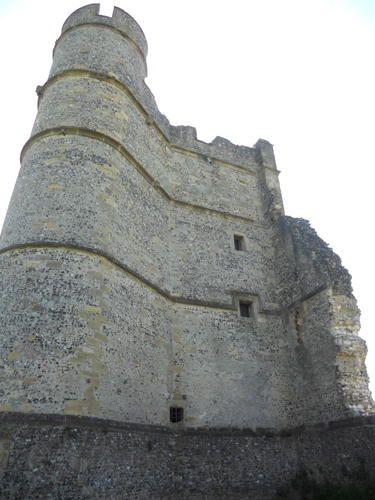 It was built in the 1380’s for Sir Richard de Abbery, a knight in the service of the Black Prince. 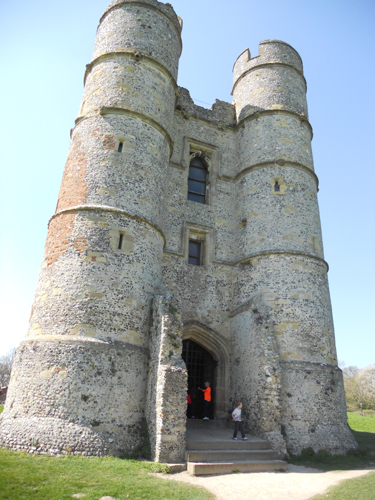 It’s a small ruin, consisting mostly of the twin-towers that made up the gatehouse. You can’t go inside these ruins, but it doesn’t look there would be much of an inside to visit anyway. The medieval castle is surrounded by the remains of artillery defenses constructed in 1643. Today, local families visit the ruins for picnics. Children swarmed the crumbled walls, chasing balls and bubbles. Parents lounged on blankets in the bright sun with picnic baskets or snacks. It’s the kind of place you could curl up with a good book on a lazy afternoon or bring a notebook and let the creativity flow. If I lived in a place like that, I would certainly visit the castle’s green lawn every weekend with good weather (and perhaps some with bad weather). 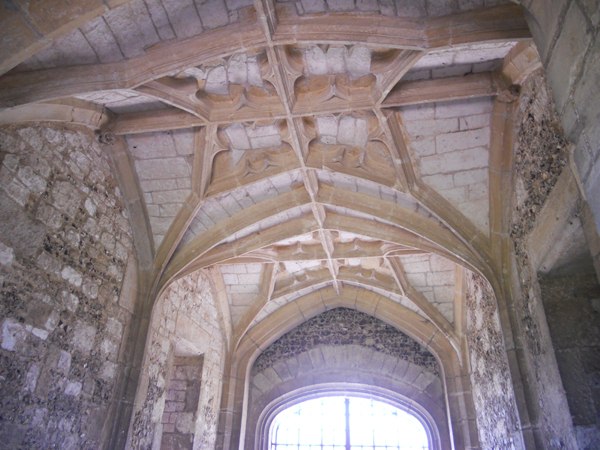 After taking a walk around the ruins and enjoying the festive atmosphere, we peeked inside at the remains of the vaulted ceiling before heading back into town. After time for a lazy lunch, we got back on the train and headed to Reading. Like every town in England, it has its own small museum. Some of the items there were of particular interest to me, having grown up in Pennsylvania. It seems Reading PA (which is not where I grew up but I am familiar with the place) and Reading UK have an historically strong connection. 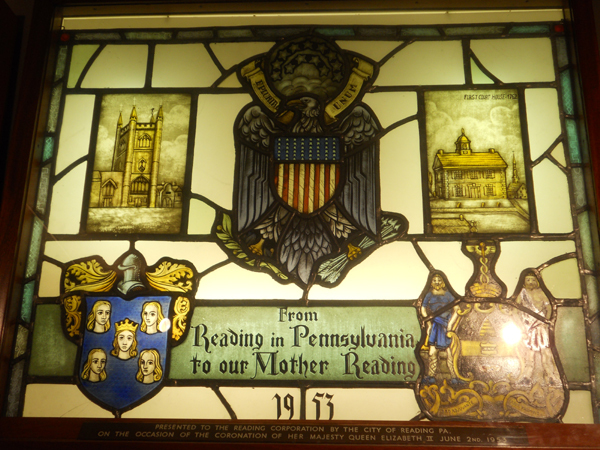 Reading PA even gifted Reading UK with a stained glass panel in honor of the coronation of Queen Elizabeth II. The highlight of the trip to Reading was their replica of the Bayeux Tapestry, created by Elizabeth Wardle and some 37 women from the Leek School of Art Embroidery. The tapestry is 70 metres (230 feet) long. It depicts the events leading up to the Norman conquest of England concerning William, Duke of Normandy, and Harold, Earl of Wessex (later King of England). The tale cumulates in the Battle of Hastings. Unfortunately, I was unable to photograph the replica, but it made for an interesting experience.